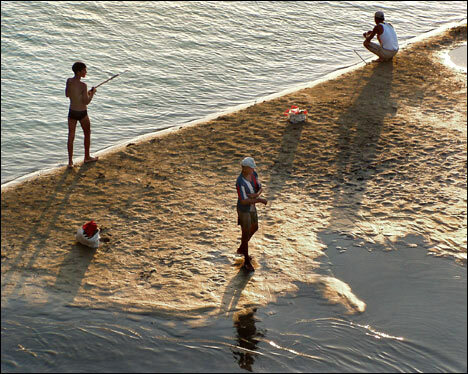 Low water level is threatening fish population in the Syrdarya River, experts say. This year the volume of water is ten times lower than last year and shoals of fish simply could not swim to spawning, Ablyakim Abirov, head of the Syrdarya state biological inspection in Uzbekistan, told Ferghana.ru. Syrdarya is the second largest river in Central Asia and flows through Kyrgyzstan, Tajikistan and Uzbekistan. According to Gafurdzhon Karimov, senior specialist of the Soghd environmental committee in Tajikistan, this year nearly half of all fish population in the Syrdarya could not produce offspring. “Most parts of the river for fish spawning dried out,” he told Asia Plus news agency. 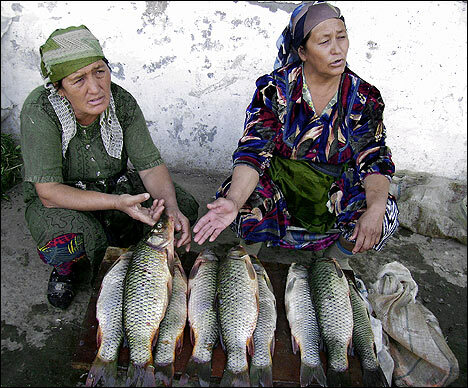 Drought has hit hard fishery in Uzbekistan. Most of the fish markets are now empty. Prices for fish have risen two times compared to the same period last year from one US dollar on average for a kilo to more than two dollars. “Water level is very low in Syrdarya and Chirchik is almost completely dry,” one of the vendors in the Unus-Abad fish market told Ferghana.ru. Salesmen from Farkhad bazaar say that Chardar is relatively full and most of the fish in the Tashkent markets is brought from there. Representatives from the Center for Scientific Fishery Development said there are no fish industries along the Uzbek part of the Syrdarya River and fishing for profit is prohibited. “Only poachers are fishing on Syrdarya and the amount of fish they catch is not registered,” representative told Ferghana.ru. Specialists from the Center were unable to tell about the fish population in the Syrdarya River. Ecologists say such low river level is unprecedented and environmental repercussions of it are yet to be seen.